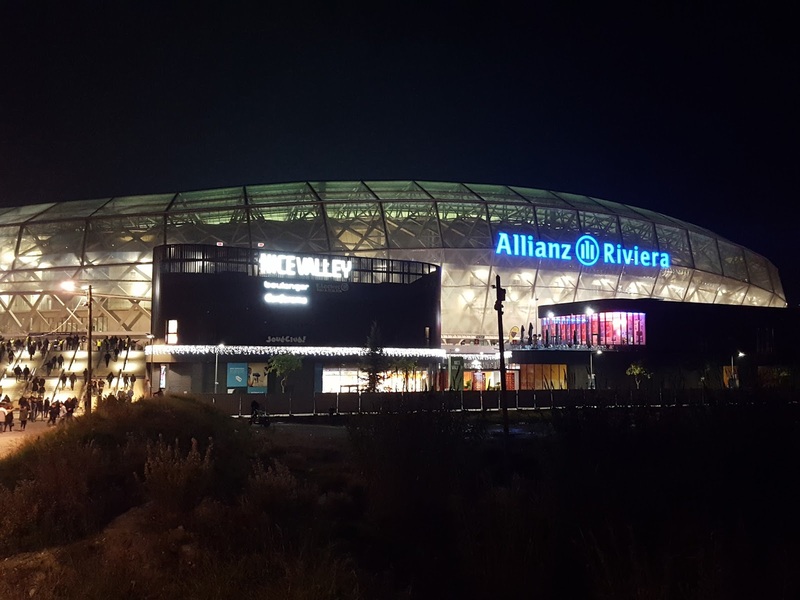 My thirty-first ground of 2017 was on Thursday 23rd November at the Allianz Riviera in Nice, Alpes-Maritimes, France. The match was Nice vs. Zulte Waregem in the Europa League Group Stage. The Allianz Riviera is located on the banks of the River Var in the Saint-Isidore area in the far west of the city. Opened in September 2013 the venue is part of a wider redevelopment of the area with plenty of free land around the stadium complex. The ground is attached to the Nice Valley commercial centre which includes many restaurants, shops and supermarkets and there is a large underground car park to cater for customers. The stadium is half a mile south-west of Saint-Isidore railway station and there are plenty of shuttle buses that ferry fans between the stadium and the city centre a few miles to the east. In addition to this the ground is just 3 miles north of Nice Côte d'Azur Airport so can be reached via here rather than going into the city centre. 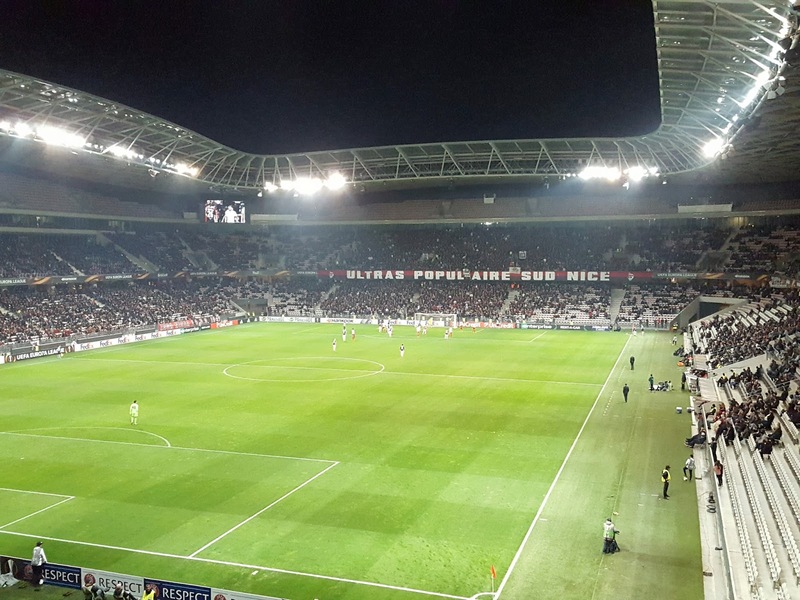 OGC Nice moved to the venue from their former home at the Stade Municipal du Ray where they had played since 1927. The stadium sits on a raised platform with some external facilities at ground level and others at the raised level. At ground level the eastern side is taken up by the Nice Valley commercial centre, the National Museum of Sport sits on the northern side, the ticket office and underground car park on the southern side and an overground car park on the western side. 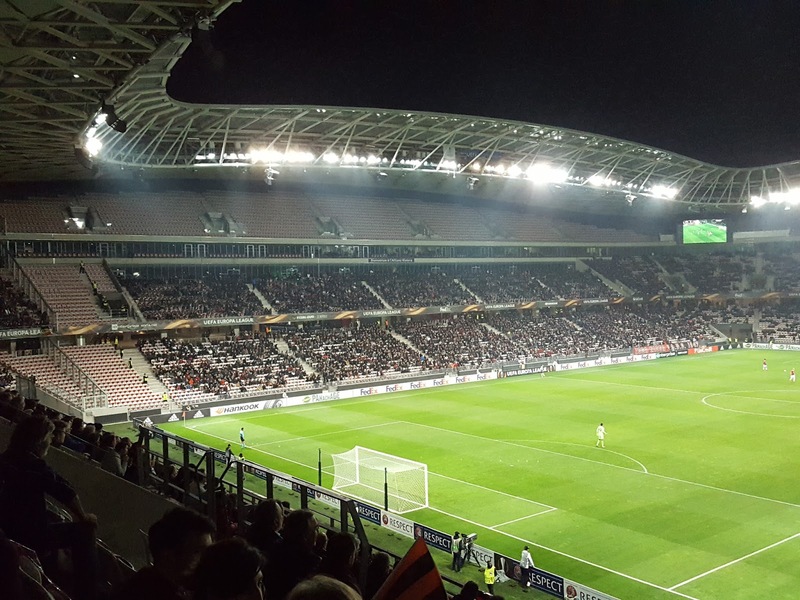 There are wide entrance steps leading up to the raised area which consists a wide concrete expanse which encircles the stadium itself. As well as giving fans a place to congregate the club shop is also included on this level. Inside the ground there are wide concourses with many concession stands in a similar vein to new MLS stadiums. 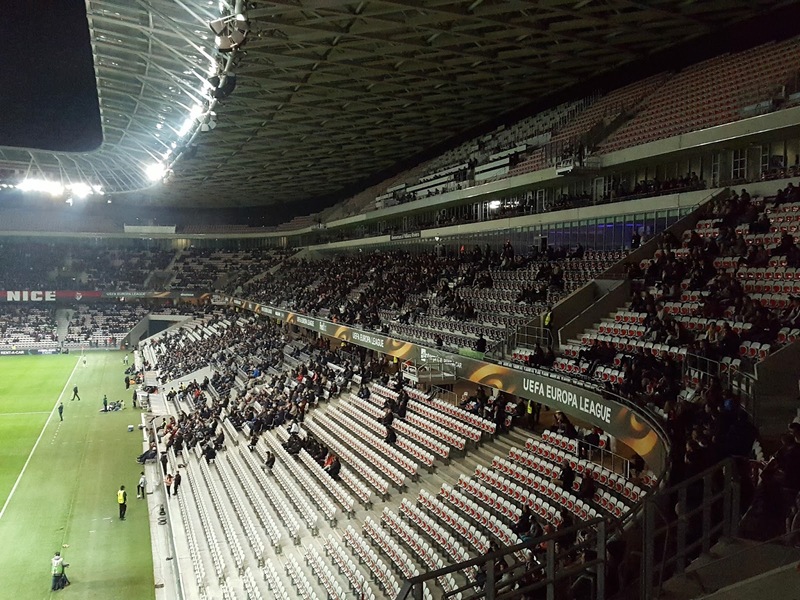 The stadium has a total capacity of 35,624 nearly double the 18,696 capacity of the club's former Stade Municipal du Ray home which they left in 2013. The seating is split into a three-tier bowl with similar sized first and second tiers and a slim 3rd tier where the viewing areas dovetail in line with the shape of the roof. In the north-west and south-east corners this lack of seating space sees two big screen TVs in their place. The club's dated former ground did not afford much in the way of hospitality but the new venue has been designed with this in mind. The back of the 2nd tier is given over to hospitality the entire way around the stadium and the western and eastern sides have some of the 2nd tier also taken up for the same purpose. The eastern side is also where you will find the two dugouts and the media section which sits in the middle of the top tier. In terms of fan support the club's ultras inhabit the southern end of the stadium and during my visit away fans were located in the north-west corner. Nice went into the game in seriously difficulties domestically with them hovering one place above the Ligue 1 relegation zone but they knew avoiding defeating in this game would see them advance to the next stage of the competition. They had a perfect start when they were awarded a penalty with less than four minutes on the clock. A ball into the area saw a race between Nice attacker Mario Balotelli and Zulte goalkeeper Louis Bostyn. Unfortunately for Bostyn he got to the ball just after Balotelli and sent him flying. Balotelli took the spot kick and sent the ball to Bostyn's left as the keeper dived to his right. The hosts looked comfortable in the early going playing some good passing football including a number of neat backheels. They went 2-0 up just after the half-hour mark when Jean Seri split the defence with a pass into the area for Alassane Pléa. He was free to square the ball for Balotelli to smash into the roof of the net from a couple of yards out. The away side didn't have too much of the game but the threat of Aaron Leya Iseka on the left wing kept Nice wary. The second half saw both sides cancel each other out with limited goal mouth action. However with ten minutes to go Brian Hämäläinen smashed a stunning 35-yard free-kick into the top corner to give Zulte hope of a comeback. The home side wanted to reassert their two-goal lead to kill off any chance of a nervy finish and managed to do that in the 86th minute when substitute Adrien Tameze went on a mazy run, beating three defenders and lashing the ball home from 12 yards out.